There’s a saying in the dental profession, “a healthy mouth starts at the gums”. If you think about it, it’s literally true. Because… we’re born with healthy gums. Our baby teeth are safely tucked away inside them. Subsequently, we gum our way through the first months of life, toothless for all practical purposes. Nevertheless, that’s when oral health becomes a daily concern. Keeping gums healthy remains a lifelong priority. We’ll discuss how to best address this, but first let’s consider the alternatives. What can happen when gums are not treated with care? Chances are you either have gingivitis, or somebody close to you does. This gum disease is, sadly, very common. In fact, more than half of American adults have it. Significantly, many of these don’t know they do. In its earlier stages gingivitis often causes no discomfort at all. We can see the early symptoms, but often don’t recognize them in ourselves because they come on gradually. Each day there’s a tiny bit more redness in the gums, a little more swelling. In the bathroom mirror, things look about the same today as they did yesterday, so no warning lights go on. We usually become aware we have gingivitis when one of two things happens. It may be that we notice some red streaks when we spit after brushing or flossing. This is blood. As gingivitis progresses, our gums bleed more easily. The easy bleeding usually comes with tenderness and sensitivity. Or, someone lets us know about the foul odor coming out of our mouths. A putrid smell. Something like rotting meat or roadkill. In fact, it’s exactly like rotting meat. It is rotting meat: our gums. It says something about human nature that this is what finally gets many people to take action. That’s unfortunate, because it’s getting late in the game at this point. Late, but hopefully not too late. Things can still be turned around relatively easily at this stage. 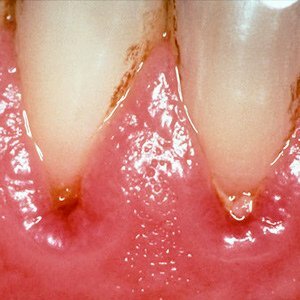 What can happen next, through neglect in most cases, is called periodontitis. This is a lot more serious. Once started, periodontitis can progress slowly, or very quickly, depending on the individual’s circumstances. In people with certain genes, and in people with compromised immune systems, the disease can run rampant. Gingivitis mainly involves the outer surfaces of the gums. Periodontitis, in contrast, penetrates below the gumline. Hence, the result is loss of gum and bone tissue, leading to loose and then lost teeth. Worse yet, researchers have linked periodontitis to stroke, coronary artery disease, respiratory disease, and rheumatoid arthritis. There may also be connections with dementia. The treatments at this stage are surgical and radical. Costly and very uncomfortable, too. The good news is that most people can keep themselves free of serious gum disease. Periodontitis is always preceded by gingivitis. On the other hand, gingivitis does not always result in periodontitis. Thus, if we can prevent or roll back gingivitis, we steer clear of the worst outcomes of gum disease. As to gingivitis, neglect is by far the most common cause of it. We neglect our oral hygiene, and develop gingivitis. We neglect our gingivitis, it progresses. Prevention of gingivitis is not rocket science. A little more detail on the disease will make clear why. Gingiva is what medical and dental textbooks call the gums. Hence, gingivitis literally means “inflammation of the gums”. Lots of things can cause inflammation in the human body. Where gingivitis is concerned, the specific cause is no mystery. It’s bacteria. You may be surprised to learn that 200-300 different species of bacteria live in communities in your mouth. Scary? Stay calm. Only a handful of these have anything to do with tooth decay and gum disease. Tooth decay and cavities are mostly caused by Streptococcus mutans, with a little help from their friends. Gingivitis, on the other hand, is generally caused by Treponema denticola and Porphyromonas gingivali. The names aren’t important. As will be shown, it’s not really important either that different bacteria cause tooth decay and gingivitis. What’s important is that all these hostile bacteria thrive in plaque. Plaque is that soft, transparent film of sugars and bacteria that forms on teeth 24/7. They eat the sugar, and, well, poop acids that cause tooth decay, and also some other chemicals that cause gum inflammation. Keep this in mind when we get to prevention. Plaque is not compatible with healthy gums. If not promptly removed , plaque turns into tartar. This is a negative development for two reasons. First, plaque is hard. It’s nearly impossible to remove plaque at home with a toothbrush and floss. It bonds very strongly with tooth enamel. Tartar can only be removed by a dentist or hygienist with their special tools. Second, tartar is invasive. It penetrates below the gum line. The bacteria that cause gum disease are a type that is happy without oxygen, so they thrive inside the gums. That’s where they assault the tooth root, the jaw bone, and the surrounding soft tissues. Tartar is like a an armored tank for bacteria. It encloses them in a hardened shell while advancing and destroying. The enemy of healthy gums on the move! You may have already realized what the first line of defense against gum disease is. Plaque removal. Because where there’s no plaque, there are no concentrations of hostile bacteria on the teeth. Thus, there’s no gingivitis. No plaque also means tartar can’t develop. No periodontitis. Very simple, in principle. As with many things in life, there’s slippage between principle and execution. Brushing and flossing are the primary tools for removing plaque from our teeth. It’s hard to imagine anyone is still unaware that neglecting these means asking for trouble. Nevertheless, it’s somewhere between difficult and impossible for anyone to brush and floss on a perfect timetable. That’s because plaque is always forming. The more food bits available, the faster it forms. Furthermore. plaque begins to solidify after about 48 hours, and 12 days later is hard, hard tartar. In order to have no plaque whatsoever, we’d have to brush and floss almost continuously. Even then, it’s impossible to reach every tiny nook and cranny all the time. Moreover, too much brushing and flossing can wear down enamel, increasing risk of cavities. Thus, what we need to do is try our best to brush (correctly!) after meals, and floss at least once a day. For most people, this is an attainable goal. We can all come up with excuses for our neglect. Many people insist brushing after lunch, at work, is simply not practical. In fact, neglect is the chief cause of decay, cavities, and gum disease. For this reason, if everybody just brushed and flossed regularly and properly, a major portion of dental treatments would become unnecessary. As a matter of fact, there’s one more step needed to make that a reality. That is, regular dental checkups. As has been noted, home care can’t effectively eliminate all plaque and all tartar buildup. Dental checkups are an opportunity for the professional cleaning that can. How frequently is “regular”? That depends to some extent on the individual. For example, our genes make us more resistant or less resistant to decay and gum disease. So do our life circumstances. Some people truly can’t brush after every meal. Six-month intervals between checkups is a good starting point. Your Orlando dentist can suggest more frequent visits if appropriate. So, it turns out that the very same steps we take to keep our teeth healthy also support healthy gums. Brushing, flossing, regular dental checkups. All we have to do, is do it.